Delaware Paddlesports has the Jackson Big Rig FD tax free! In stock now and TAX FREE! Length - 13' - 3"
The new JK hatch now comes with heavy duty locks. Tuck your paddle blade under this Hypalon keeper to get it out of the way but still in arm's reach - snag-free for your treble hooks! Resistant to UV damage and temperature extremes, this material will keep your paddle safe! Storage for 4 rods with extended reach for fly rods as well. Experience smooth sailing with rudder controls on both left and right sides of the seat. Use one or both. Jackson Kayak (JK) warrants to the current owner, upon proof of purchase by the original owner this Jackson Kayak to be free from any defects in material or workmanship, and to conform to the product specifications set forth in this owner’s manual if the product is used and cared for in the according to the instructions furnished, for three years, as outlined below, from the date of purchase by the original owner. 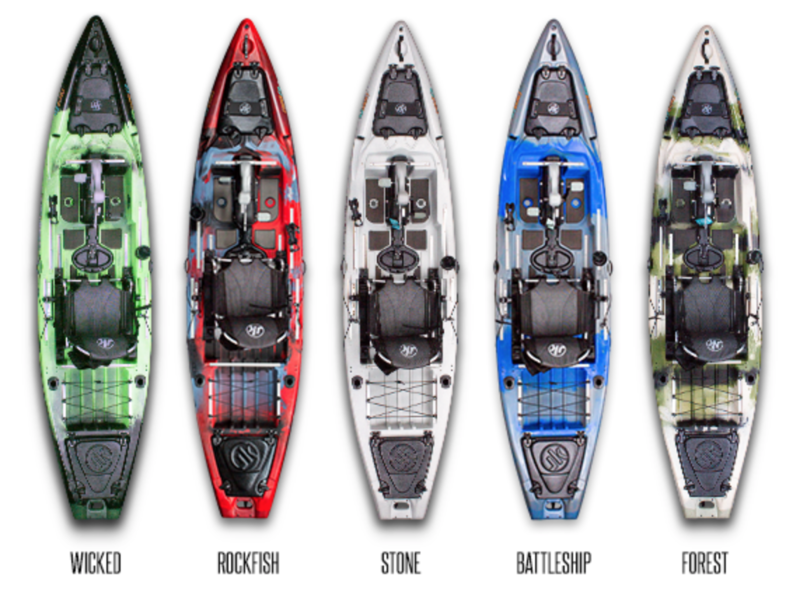 The warranty period for boats sold by Jackson Kayak as “demos” begins when the boat is first shipped from Jackson Kayak. 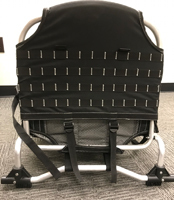 Customer is responsible for all shipping and handling fees to and from Jackson Kayak’s manufacturing facility or some other place which Jackson Kayak may designate. This warranty is void if the boat is altered structurally or subjected to stresses beyond the physical limits of the boat’s material. The warranty does not cover abrasion or abnormal use. Jackson Kayak reserves the right to change products or designs without incurring any obligations to incorporate such designs into already completed products or those in the hands of dealers or consumers. The warranty contained herein is the exclusive warranty made by JK and there are no other warranties, expressed or implied, including warranty of fitness for a particular purpose of merchantability made with respect to such boats. JK is not liable for any injury sustained in the use of this product. The user of this product acknowledges assumed risks and waives any and all claims against Jackson Kayak and any of its agents. In no case will Jackson Kayak be liable for incidental or consequential or special damages. Some states don’t allow the exclusion of incidental or consequential or special damages, so the preceding exclusion may not apply to you. The warranty gives you specific rights and you may also have other legal rights that vary from state to state.